It is from my musical home that my love for this concerto stems. The language, the Austrian dialect, goes hand in hand with the articulation and colouring of this music. Mozart, Haydn – they are the founding fathers of this musical language. 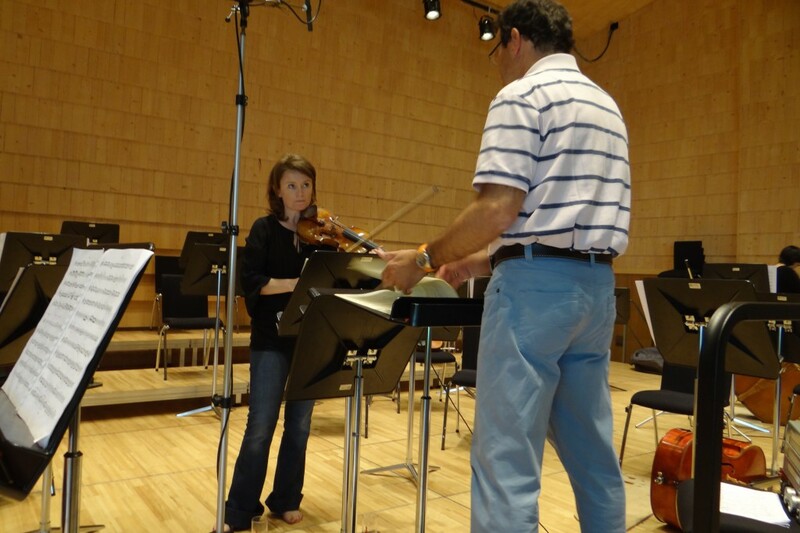 One doesn’t play a Berg violin concerto any differently to a Mozart concerto. It requires the same transparency, the same articulation. This is not a violin concerto in the traditional sense, where the soloist stands in the foreground – rather it is a most intimate chamber musical dialogue between all the players. However for me this piece is not simply an expression of my musical origins. To me it is like an unconscious promise, a vision which Berg left to us in the face of his nearing death. It is a requiem for a girl who passed away at the age of nineteen – the first movement describes her carefree youth, her love of nature, her maturing into a young woman. The second movement is the portrayal of her deadly disease, the pain, the suffering, the loss of motor skills, up to the “cry for help” at the moment of her death. However the piece does not end here! This work describes the journey of a soul here on earth, its transformation through death and its return home into the light. Within the piece is contained the deep knowledge of the ultimate immortality of the soul. …On responsibility, hope and new energies! A week ago, I was invited by JONDE, the Spanish national youth orchestra, to coach and look after the first violins for two concerts. For three days, I spent a very special time with wonderful young people, which touched me deeply and caused me to reflect on many things. These three days made me clearly recognize a new generation of musicians. A new generation that is prepared to let go of old patterns like competition, jealousy and power, and wholeheartedly embrace their inner calling, their love of music. This expressed itself not only in the irrepressible desire to make music together at the highest level, but also and especially in the interaction with one another. This group was carried by a love, an understanding and reciprocal support, joy in each other, as I have never experienced before with such intensity. The musical result was in accordance! These are the new energies we so desperately need; this is the hope that I have for the future of music and future generations of musicians! But now who bears the responsibility for making it possible? Doesn’t one hear over and over that the next generation is responsible for making the world a better place? It is supposed to be the task of the youth. W e put all our faith in the youth. I agree with this only up to a certain point. I believe that we, the preceding generation, bear the biggest portion of the responsibility! We are the ones who have to create a sphere for each new generation to be able to further evolve and heighten the energies with which these people are already equipped when coming into this world. It should not happen that we simply pass on unfiltered, unchanged, everything we had to go through to these “new humans”, thereby pulling them into our “old frequencies”, so that they have to go through the same kind of negative experiences, which we should have transformed into positives within our personal development processes a long time ago. Life is an exchange. If we give the next generation the basis, the faith, the recognition and the belief in itself to create a new humanity, the young people will turn to us in gratitude, because they then have the possibility to respectfully bow before all preceding generations, who took it upon themselves to endure terrible conflicts, forgive one another and thus heighten their energy one step at a time. These young people whom I had the privilege of meeting, have managed this. And I know that they will always carry this shared experience in their hearts, and open new and even greater gateways of light for their children! 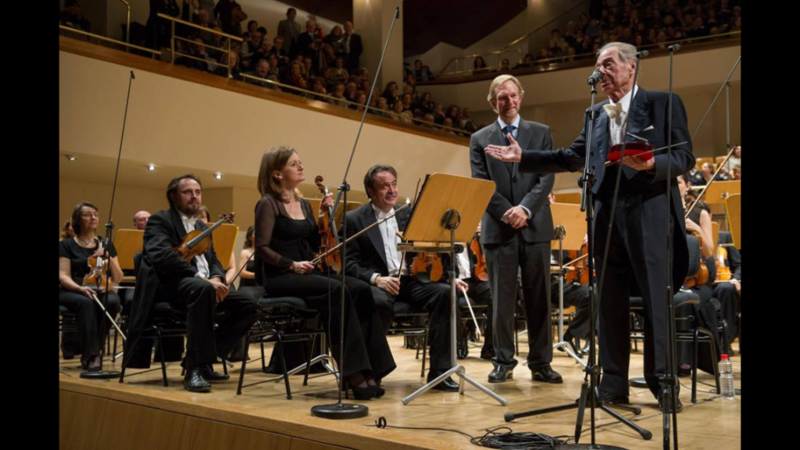 A sad piece of news causes me to leave this entry in my blog today… Maestro Fruhbeck de Burgos passed on this morning. Maestro Fruhbeck de Burgos was my first „boss“ at the Wiener Symphoniker from 1994 to 1996. He was a very fair person, who knowingly kept a respectful distance to each of his musicians. He made no distinctions, no exceptions, he treated everyone equally! It was my first concert as first concertmaster, with Raphael Frühbeck de Burgos on the podium of the Wiener Symphoniker at the Wiener Konzerthaus. On the program, among other things, The Three Cornered Hat by de Falla. There was a small discrepancy between the first violins, and I tried my best to follow the conductor in order to smooth out this minimal irregularty… With no success. After the concert – as etiquette dictates – I went to the Maestro´s room to thank him and to apologise for the little incident. My dear readers, you have no idea what a long road the dear, venerated Maestro spared me with that piece of advice! No arduous learning from critical situations – simply one distinct pointer, the depth and clarity of which stay with me until this day. Many years later we met again at more or less regular intervals: in Bergen, in Seville, and my last encounter with him was with „his“ Carmina Burana with the Orquestra Nacional de Espana in Madrid before Christmas. Following the concert there was a ceremony to honour him on the occasion of his eightieth birthday. Thank you, Maestro Frühbeck de Burgos! May you return to all of our source, accompanied by the music of angels! It was with this spectacular view that a wonderful, intense and unforgettable time began for me in Ossiach in southern Austria. Ossiach is a small village with a large abbey and an even bigger and very well known summer festival, the “Carinthischer Sommer”. 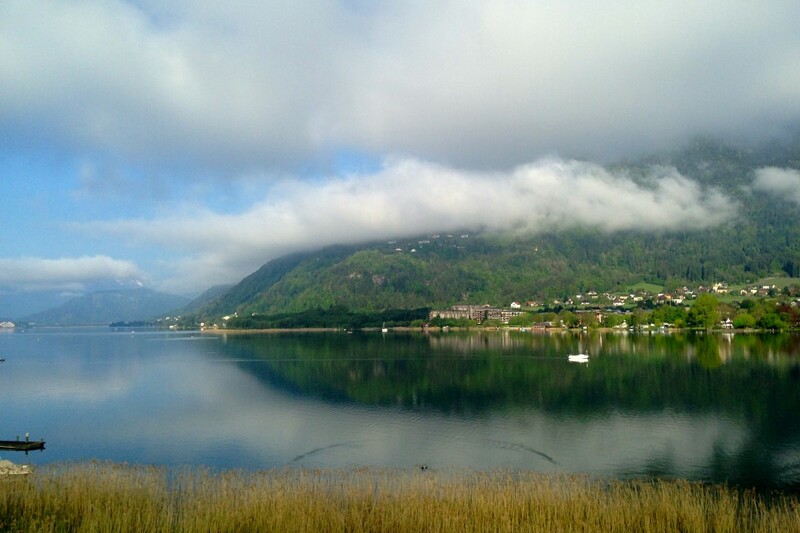 It was actually in Ossiach that my career began – in 1988 Dr. Gerda Fröhlich, then director of the festival, invited me to perform a matinee of sonatas as part of their “Young Talents” cycle. The program consisted of one of the two-movement Mozart sonatas, the Cesar Franck sonata and Schubert’s Fantasy in C major. This time is was not the Carinthischer Sommer, but the National Bank of Austria who made my stay in this beautiful and special place possible. Every year, as part of its project “Wertvolle Klänge” (“Precious Sounds”), a CD is recorded with instruments from its collection and the players of those instruments. This serves not only to create an archive of the sound of the instruments, but also to have Christmas gifts to offer the bank’s clients. After Christmas, I can buy back the master tape and all the rights to the recording – a very generous gesture of the Austrian National Bank. A big thank you to my loyal sponsors over so many years. 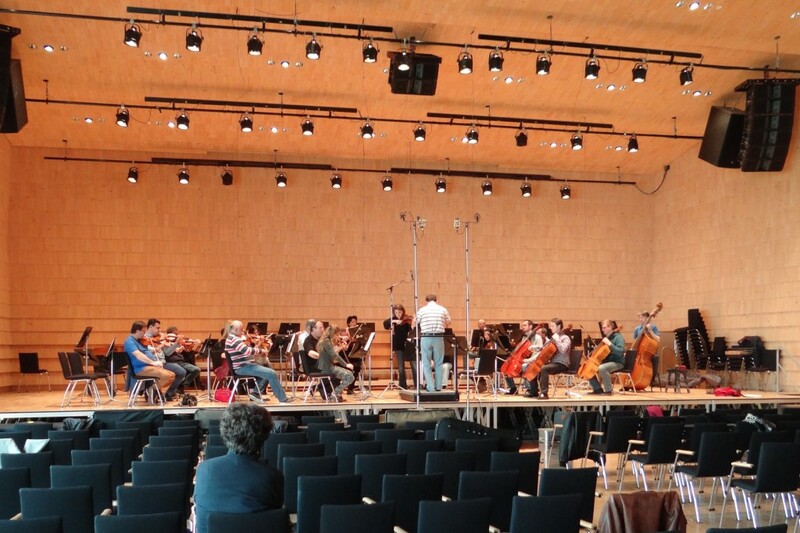 For my CD, the newly built, acoustically brilliant Alban Berg Saal was chosen! I was accompanied by the Kärntner Symphonieorchester under the baton of Martin Kerschbaum. Wolfgang Amadeus Mozart, Franz von Suppe, Franz Lehár and Kurt Schwertsik. When I think of Kurt Schwertsik, I think of Joseph Haydn – not stylistically of course! Schwertsik has his own tonal language, but the intelligent humor in his music reminds me so much of Haydn! 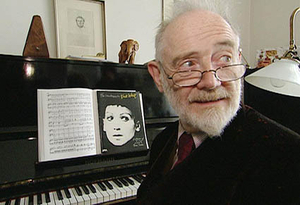 Let me begin with Martin Kerschbaum – what a fantastic, musical accompanist! Martin’s precision, stability and clarity on the podium really eased the difficulties of this piece for all of us. His ability to empathize – musically as well as personally – deserves special mention. A big thank you to my colleagues of the Kärntner Symphonieorchester, who, with their exceptional professionalism and graciousness, created a work environment in which it was possible for me to forget the pressure, let go of the tension, and just give myself over to my bliss. THANK YOU! A special thanks goes to principal conductor Alexander Soddy, who generously gave his time for a preparatory rehearsal of the Schwertsik. In my next blog entry I’ll introduce “the incorruptible voice from inside the speaker”, my recording director. The one who isn’t heard, but whose ear, ability, and love for the music and musicians make him the real protagonist of this project. I really look forward to telling you about this special human being. Tired and contented, we rounded off the first day of recording with a delicious meal and a fine glass of Austrian wine at our delightful lodgings, the “Stiftschmiede”. Days two and three to follow shortly! I welcome you all to my new website, and to my blog! To blog or not to blog, this question kept me pondering for quite a while. Should I do this to myself? Should I do this to anyone ? Then, as I was creating this new site and updating my resumé, I realised that this year is my twentieth anniversary as a concertmaster. And I´d like to share with you everything I felt as I became aware of this period of time and all it means to me. Twenty years… Looking back, it feels like time has simply flown, its almost unbelievable… It has been an incredible journey through the depths of musical, emotional and human intensity, through ups and downs, moments of glory and of learning that can´t be forced into a time scheme. It is about an inner treasure, immeasureable, infinite. Writing about my musical carreer could be interesting, of course, but in this opening blog I prefer to briefly relate my personal journey – the development I was priviledged to experience. How does it feel to become the concert master of a major symphony orchestra at the age of 24? Exhilarating, for the soul, but also in no small measure for the ego… You have proved something to yourself, but also to everyone else, and naturally you are happy and proud of your achievement. How does it feel, twenty years on, to have become the concertmaster of a comparatively young, up-and-coming symphonic orchestra in Spain? My soul rejoices, and I am filled with a deep sense of gratitude. Gratitude for being able to contribute some of the experience I have gathered over the years, but also to build upon it further. Gratitude for working in an environment that allows me to fully open my heart to the music, let go of my ego and immerse myself in boundless creativity. I’ll surely tell you about the road in between these two milestones in other entries. Maybe this blog can become an inspiration to my young colleagues, and for those of my own generation a place for looking back and reflecting, but hopefully also for smiles and hearty chuckles!